By Various Artists. Tompkins Square Records. Estil Cortez Ball and his wife, Orna, performed original gospel and country folksongs throughout Virginia, Tennessee and North Carolina, as well as performing for a local radio gospel show from their hometown of Rugby, Va., for over 40 years. E.C. and Orna created a huge catalogue of songs, mostly gospel-based, with E.C. providing lead vocals and guitar and Orna providing accordion and vocal accompaniment. E.C. was first recorded by John A. Lomax in 1937, then by John's son, Alan Lomax, in 1941. Subsequently, the Ball duo was recorded by Mike Seegar, among others. The Balls also released a handful of full-length recordings from the late 1960s and early ’70s before E.C. died in 1978. Under the guidance of Louisville-based guitarist and musical archivist Nathan Salsburg and musician and producer Paul Oldham (brother of Will Oldham/Bonnie ‘Prince' Billy), the New York-based folk label Tompkins Square has served up another quality, eccentric slice of the Americana pie with Face A Frowning World. Vocalists including Bonnie ‘Prince' Billy, Jolie Holland, Samantha Parton of The Be Good Tanyas, Freakwater's Catherine Irwin and Jon Langford, among others, lend their interpretations of E.C. Ball's songs backed by The Health & Happiness Family Gospel Band, a seven-piece outfit dedicated to performing gospel-based songs. The Handsome Family, the husband/wife duo, Rennie and Brett Sparks, nail "Jenny Jenkins" relaying the humorous and playful spirit of the original. St. Louis oddball singer/songwriter Pokey LaFarge lends a sincere execution (and sentiment) to "Plain Old Country Lad." Louisville-based songwriter Joe Manning provides two stirring songs, the hard-edged "Warfare," and a chilling duet with fellow Louisville musician Glen Dentinger ("Tribulations"). The H&HFGB, who come from various points of Louisville's musical compass, often deftly compliment the voice of the singer, though, on occasion, they have a tendency to overwhelm or rush the song, such as on Langford's barreling version of "When I Get Home I'm Gonna Be Satisfied." It would seem that Ball's songs are best suited to a more spare arrangement, thus it's the most skeletal renditions that shine on this memorial album. The eccentric folk legend Michael Hurley, with his distinct guitar playing and arrangement, presents an amazing version of "The Early Bird Always Gets the Worm," that is both true to the original, while making the song his own. The other gem is offered by Uncle Earl band member Rayna Gellert, whose raw, lonesome treatment of "Lord I Want More Religion" is genuinely heartbreaking. Oldham and Slasburg have assembled a fitting tribute to a small town school bus driver and gas station manager, who delivered his gospel through folk music, connecting with audiences in numerous, intimate performances or from live-radio broadcasts. 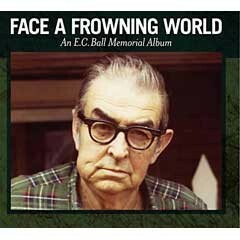 Face A Frowning World works also as a tribute to that tradition of true folk music -- music for folks, made by folks.